A researcher at Rochester Institute of Technology is unraveling a mystery surrounding Easter Island. 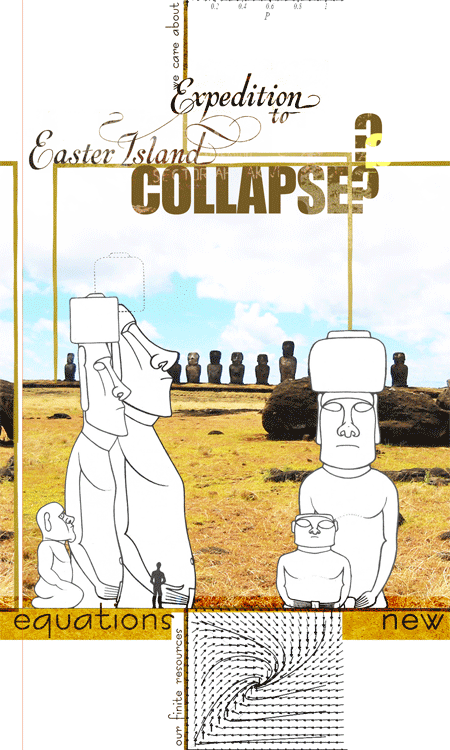 William Basener, assistant professor of mathematics, has created the first mathematical formula to accurately model the island's monumental societal collapse. Between 1200 and 1500 A.D., the small, remote island, 2,000 miles off the coast of Chile, was inhabited by over 10,000 people and had a relatively sophisticated and technologically advanced society. During this time, inhabitants used large boats for fishing and navigation, constructed numerous buildings and built many of the large statues, known as Tiki Gods, for which the island is now best known. However, by the late 18th century, when European explorers first discovered the island, the population had dropped to 2,000 and islanders were living in near primitive conditions, with almost all elements of the previous society completely wiped out. Population scientists use differential equation models to mimic the development of a society and predict how that population will change over time. Since incidents like Easter Island do not follow the normal progression of most societies, entirely new equations were needed to model the outcome. Computer simulations using Basener's formula predict values very close to the actual archeological findings on Easter Island. Basener will next use his formula to analyze the collapse of the Mayan and Viking populations. He also hopes to modify his work to predict population changes in modern day societies.